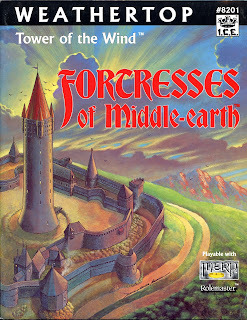 Weathertop was first in the short-lived fortress series, whose stated intent was "to provide DMs with extremely detailed overviews of individual towers, castles, citadels, and other fortifications of particular note". It's also the best, though that's probably my love for all things Arnor talking. I was so excited when it hit the stores back in '87 that I ignored most of my college assignments that week, and spent time in my dorm room penning an adventure that would require decent characters to steal the Master Stone of the North against their will. The fortress modules cover an amazing abundance of detail in short space that I remain surprised only four were published; three will be covered in these retrospectives. What can be said about Arnor's bastion? It was everything: the realm's greatest stronghold, home of the High Seer and chief palantir, and strategically situated on holy ground -- all, of course, tragically gone after the Witch-King's army demolished it in 1409. When I first saw Peter Jackson's Fellowship of the Ring and the hobbits were camping at the circle of stones, I thought of what those stones used to be, and got immediate chills. There's potent history here, and the rocks are full of it. The module even traces back to the sacred times of the First Age when the hill was an astrological holy site for the Edain, though the treatment is understandably brief; the focus of the fortress series is on architecture rather than history. 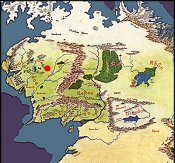 For the Third Age, the tower garrisons and civilian populations are detailed for all relevant periods, in particular the military forces supplied by each of the sister kingdoms (Arthedain, Cardolan, and Rhudaur) when Arnor split in 861, and possession of the hill was hotly contested. The layout of Weathertop is breathtaking, I believe the most thorough treatment of any stronghold put out by ICE with the exception of Dol Guldur. The critical part is of course the tower, and all rooms on all fourteen levels are fully detailed and even given artistic representations so you can tell just at a glance the function and contents of each room. In addition to guard halls and guest chambers are the armories, libraries, alchemical hall, sage's hall, warden's chambers, king's chambers (for when he visits), and the seer's chambers which contain the holiest of holies, the Hall of the Stone. The outer defenses are covered just as diligently: the lower and upper gates, the prison tower, bastions and watches, stables and smithies. It's rare to see this level of detail in any gaming product. The only weakness to Weathertop is no one's fault, just historic fate. It doesn't exist after 1409, which constrains the time period. The earliest setting for any characters I DM'd for was the Kin-Strife... but that didn't stop me. I just ended up geasing my best friend's Greyhawk characters to pay a visit to Middle-Earth on the eve of the Second Northern War and steal Weathertop's palantir. It was a hell of a ride, and I don't think he thanked me for it. Next up: Thieves of Tharbad.